It’s summertime and the living is easy, but that doesn’t mean you can be careless around the grill! Between celebrating with friends and family and the thrill of bright fireworks this Fourth of July, it can be easy to lose sight of proper shopping, storage, and grilling measures of meats, poultry, and seafood. As you plan your long weekend celebrations, keep these barbecue food safety tips and tricks in your back pocket to ensure you and your guests have an enjoyable and worry-free holiday. Choose proteins, such as meat and poultry, just before checkout to avoid raising internal temperatures. Be careful to avoid packages that show signs of tearing. Store raw meat and poultry in plastic produce bags to avoid cross contamination from other items in your cart and have your cashier store them separately when bagging. Drive right home so that these items can be refrigerated within one hour, helping to maintain freshness. If your protein won’t be used within 1 or 2 days, store it in the freezer. Otherwise, keep it in a refrigerator that is 40°F or lower. Never leave raw protein at room temperature for over two hours. Marinate your proteins in a food-safe container and keep them fully covered in the fridge. If marinating in a plastic bag, place them in a glass or plastic container before putting in the fridge to avoid leaking and be sure to dispose of the bag immediately after use. If traveling, keep your marinating proteins in a cooler to maintain safe internal temperatures. Be sure to clean the cooler immediately after use. Always make sure proteins are fully thawed before grilling. If not fully thawed, you run the risk of overcooking the outer edges while leaving the inside undercooked. Never partially cook meat or poultry to finish cooking at a later time. Only place grilled foods on a clean serving platter—never on the same plate that contained them while raw—and only use clean utensils to handle cooked proteins. 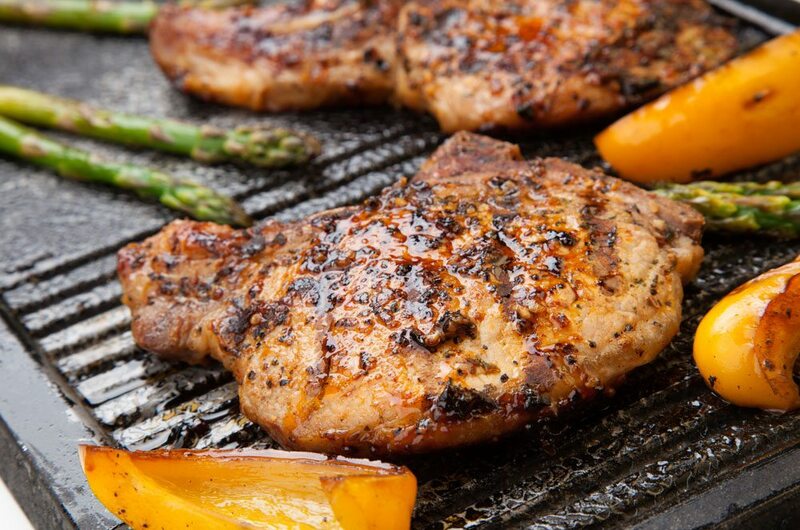 When grilling, don’t use the same marinade that was used on raw protein. Only used fresh marinades to avoid cross-contamination. Grill chicken and beef separately from seafood and vegetables. Seafood and vegetables require much less cooking time, meaning bacteria from uncooked chicken or beef can be transferred. Don’t rely on your senses to know when “something is done”. Use a cooking thermometer to be ensured of proper internal temperatures. As you prepare for Fourth of July barbecues and picnics, stock up with the affordable prices of your local Foodtown supermarket! Be sure to follow these barbecue food safety tips and check in with the butchers and staff of our meat and seafood departments for additional grilling methods and recipes. Find a Foodtown grocery store near you for affordable prices on must-have barbecue supplies and ingredients! If you’re really strapped for time, find a Foodtown On the Go participant to take advantage of in-store pickup or home grocery delivery & download our mobile app.